After a dizzying number of triangle attempts and being quite spoilt this season in general, it was finally time to go for the big one, the New Zealand open distance record. The bar has been raised in recent months by Bryan Moore (with Pete Groves) and then Angus Tapper. 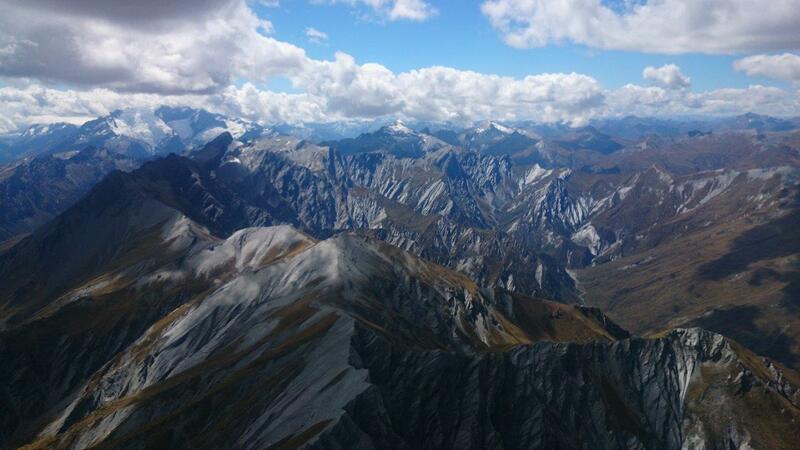 Both flights ended roughly at Mt Cook (a later flight by Grant Middendorf started there) with Angus’s flight starting further back, on the limits of Queenstown airspace. My flight started a little further west, closer to my base at Glenorchy. My triangle attempts fizzled out after a windy day being swept from tired old Roy’s peak into the Cardrona valley. On the next decent day I hiked above Muddy creek in the Rees valley for some sunny morning faces, but gave up after failing to push through the inversion. I really started getting worried when the same thing happened at Tooth Peak, failing to break through on steep sunny north facing cliffs while Bryan nearly broke my triangle record. It was 23 February now and I didn’t want to waste any more time with inversions – the remedy was to get into the Shotover. Kamila dropped me off and pitifully hoped she wouldn’t see me again that day as I walked up Mt Judah. After a short climb to cloud base at a paltry 5000 feet or so I pushed deeper into the Buckler burn, higher and deeper, finally leaving the wispies to push the easterly headwind with just enough height to breach the col north of Mt Larkins and get into the Shotover catchment. There was no going back now. Pushing north I edged my way between craggy mountain top and the clouds, with some character building lee side struggles to get ahead of Mt Aurum in the wind now coming from the northeast. A thermal in a place I’d never been and then back to familiar Mt Campbell where I got a good climb and continued north. 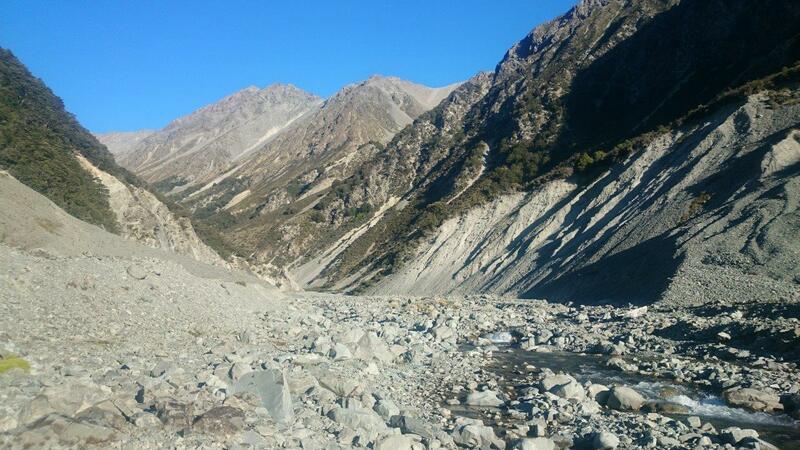 Then back to lower cloud base as I reached the Matukituki valley, and flew deep into the shade up the East branch. Gradually getting lower over tussocky slopes I pondered top landing, and wondered if I’d have the resolve to do it or I would just risk decking it in the valley. I’m not sure whether it was an active choice, but as I continued north I found salvation as the ground dropped away to steep cliffs and just a little sun got me swiftly back over the peaks. Here I took a sharp right and started heading east. The views to the west were awesome with cloud spilling down like a waterfall over the main divide, just across the valley, but it was no place to linger. 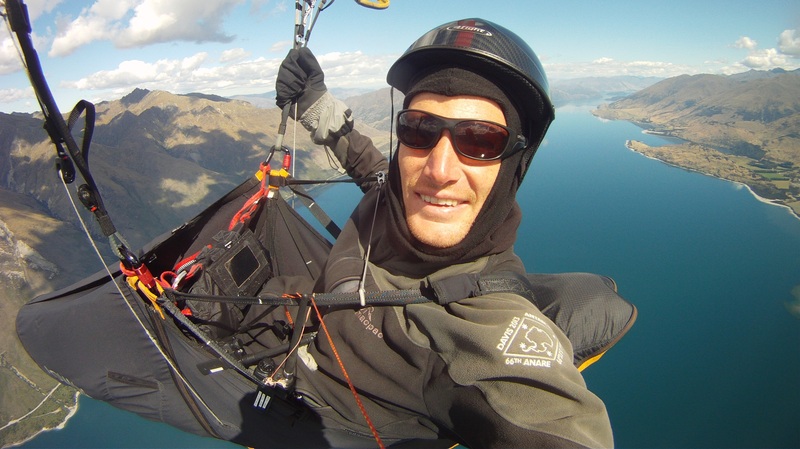 Soon I was crossing Lake Wanaka and climbing over Boundary creek, conscious of the time ticking by and the shorter days but thinking I’d done the hard part of the flight and it was time to get some easy mileage and possibly approach the record. Without topping out I crossed the Hunter valley and climbed on the other side. Drier country and without wasting too much time I found a good climb. Looking north the peaks disappeared into the clouds so it was time to make a long crossing towards the Barrier range. I felt the southerly now and despite the late hour, the climb above the rocky slopes, shaded by the big sucking cloud above them and fanned by 15 knots of southerly, was one of the roughest climbs I’ve been in! Cloud base was significantly higher here than immediately to the west. It was time to go on a long downwind glide. A little top up on the way but I didn’t have to alter course, I was heading straight for the Neumann range. Coming in not too far below the peaks, the strength of the southerly rushed my decision as I approached a spur – left or right? Neglecting the sunny lee like I normally do, I unsuccessfully tried to soar the front and in the end made a desperate glide for the Ben Ohau range. Too low, I landed in Irishman stream near the mouth. Had I missed the climb in the sunny lee on the Neumann range I would have been cut off by the low clouds obscuring the range… but would I have gotten that climb? If I had, I would or at least should have climbed up on the Ben Ohau range, and from there would it be a possible long glide to the record? Who knows – for now it’s my personal best and I think I’ll have to try again next season. Landing at 6:38pm, I had time for another little adventure – a walk up Irishman stream. With just enough water to make you think about finding a good place to cross, I boulder hopped my way up the stream. It got interesting in a gorgy section, where once I had to take the pack off, sneak under an overhang, and then make a bridge over the water with my legs while I stretched back to retrieve the pack. And the short climbs through the bush to avoid other parts of the gorge were equally exciting. Before dark I found a spot to bivouac on the forest edge. The next morning I got up early and climbed out of Irishman stream to a pass that faced the south. The last little section was loose scree and anyway a northerly over the pass killed any idea of flying from there. I continued down on the other side to a tussock shelf. Here I could see five thermals – marked by rising whispy cloud – the day was starting really early. The wind was still on my back though so I had to descend a little further until the thermic gusts were coming up the slope. My launch wasn’t entirely textbook – I got plucked up, came down again expectantly light footed (and one arm, but still holding the brakes), and then lifted off. Up and out and I thermalled up well above the big cloud that was forming off the front of the range. 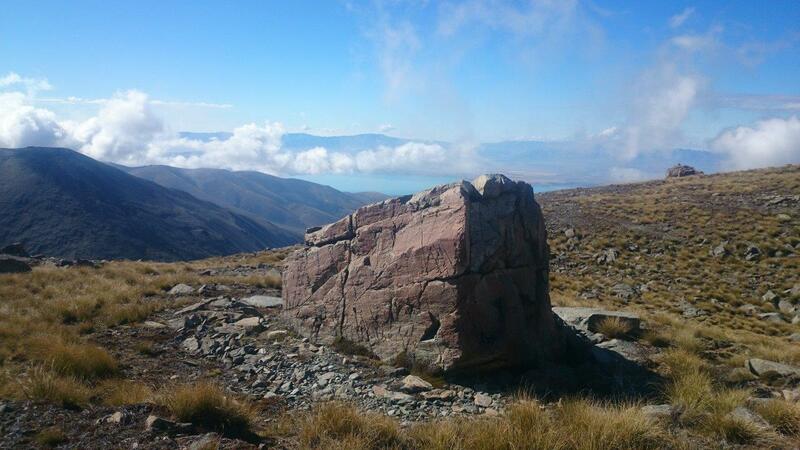 Then a quick run along the east facing spurs until I had to leave the Ben Ohau range for a long (long!) glide into the flats. Almost at the road and I was starting to think that might be the end of it – but finally I scratched away to get a low save. Later I found that a flying buddy had seen me from the highway and had sent me a message urging me to continue from my early start and fly 200km! But meanwhile I was happy to have gotten an easy ride out, and reasonably confident that it would over develop soon – I’d already seen showers up the Huxley and a big cell to the southeast. Nevertheless it was certainly worth seeing how far I could get, not even any need to feel guilty that my route lined up with the highway. Unfortunately though I got dumped to the ground soon afterwards, very much underestimating the extent and strength of a sink cycle behind a cloud which had looked good when I glided for it but offered me no ride to cloud base. I landed a short walk from Omarama, checked the weather forecast and hitched directly back to Queenstown. A nice little confidence boosting trip on the tail end of the season.